In 1997, a referendum saw 74% of voters backed the creation of a Scottish Parliament. A year later, in 1998, the Scotland Act was passed by the Westminster Parliament and the first elections for Members of the Scottish Parliament (MSPs) in 1999. The Scottish Parliament handles ‘devolved powers’ – sets of policies that are controlled by the Scottish Parliament, while the UK Government in Westminster retains some powers, generally those policies that affect the whole of the United Kingdom. Some of the powers retained by the UK Parliament in Westminster include; Benefits and social security, Immigration, Defence, Foreign policy, Employment, Broadcasting, Trade and industry, Nuclear energy, oil, coal, gas and electricity, Consumer rights, Data protection, and the Constitution. 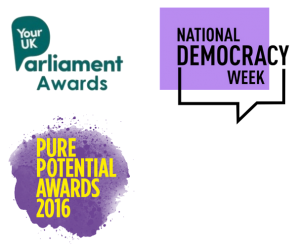 Why engage in the Scottish Parliament elections? The Scottish Parliament has power over many of the services you use every day, by voting you can help to decide who will be making decisions about these important issues. You can vote for candidates who have a similar vision for the future of your community or region as you do. Voting enables you to help decide who represents your local area or region in the Scottish Parliament, it’s part of their job to raise local issues and support you as much as they can. You can go to them and ask for advice on certain issues or ask them to promote an issue in the parliament. The Scottish Parliament uses the Additional Member System (AMS) to elect its Members of Scottish Parliament, this is seen as a ‘more proportional’ system than FPTP. AMS combines elements of First Past the Post where voters mark an X next to the candidate they want to represent them in their constituency, and proportional representation, where voters select from a list of candidates for each party who represent a larger regional constituency. This helps to overcome the disproportionally often associated with First Past the Post elections. Under AMS, each voter typically gets two votes – one for a candidate and one for a party.